So ordinarily I need less inducement to walk than Adam Gilchrist, but today I woke up with a sense of trepidation. It wasn’t the fact that I was taking 60 students up the mountain with me. 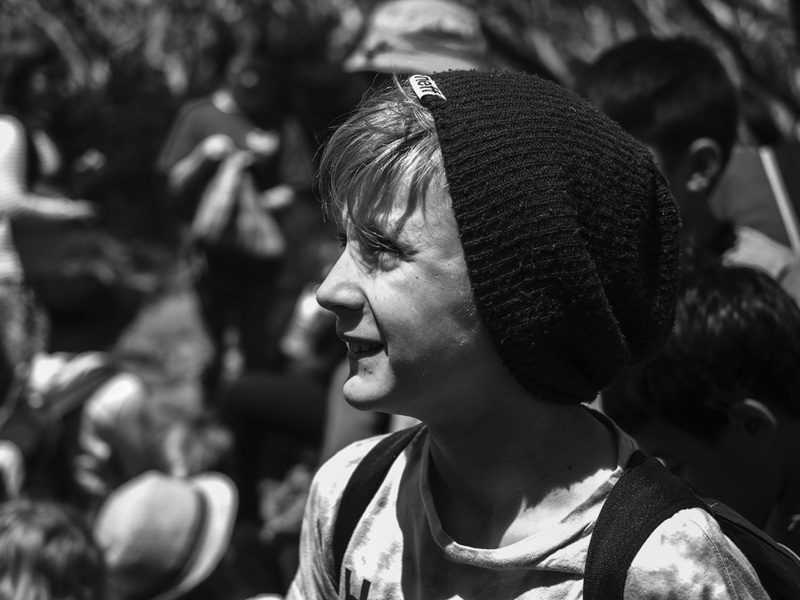 Being able to share a great walk with others just enhances the experience for myself and I knew I was taking a great group of kids with me so I was glad to have them along. The source of my concern was my ongoing struggle to recover from a serious leg injury, which had appeared to be going very well until a recent setback. Still, I had been given the green light by the physio so I put my faith trust in his expertise and tried not to think how difficult it would be if my leg did fail me halfway up the mountain. If I showed an overt lack of enthusiasm, it was nothing compared to some of the students who were pretty tired after a long first day of camp. For a few, bed time had felt as overdue as the government’s removal of the Clean Energy Commission’s ban on investment in wind energy. Abstar actually fell asleep on the bus on our way to the mountain, which was quite an achievement considering we were being thrown around on the bends like government grants in an election year. We got off the bus at the springs and waited around for longer than I had anticipated, as half of the group of sixty took turns using the few toilets nearby. Once everyone was ready we set off going up past the upper car park and onto the track towards the summit. Some of the kids couldn’t quite believe we were going all the way to the summit, which did seem quite a long way away from this view point. Immediately after the car park is a steep set of steps for maybe 100 metres. At the top of these the Icehouse Track branches to the left and the Zigzag track continues straight up. “Are we half way?” one student asked at this point. I shook my head and pointed the left fork. “Just keep swimming, Dory,” was all I said with a chuckle. You could be forgiven for thinking being a longer track, the Icehouse Track would be a gentler slope, but you wouldn’t be forgiven by the track itself which is probably steeper for much of the way. After heading to the south for a few minutes of even ground, the narrow path turned abruptly and began to climb steeply. There wasn’t too much to see at this point, with the thick vegetation crowding in on each side, but the kids and I continued on cheerfully. As we climbed higher, the surrounding foliage began to diminish a little. After about 40 minutes we came to a great open boulder field, where we stopped for some morning tea and a drink. While most of us were enjoying the scenery and the break, this was also the scene of the first crisis of the day, when Abby had a leech crawl on her foot. 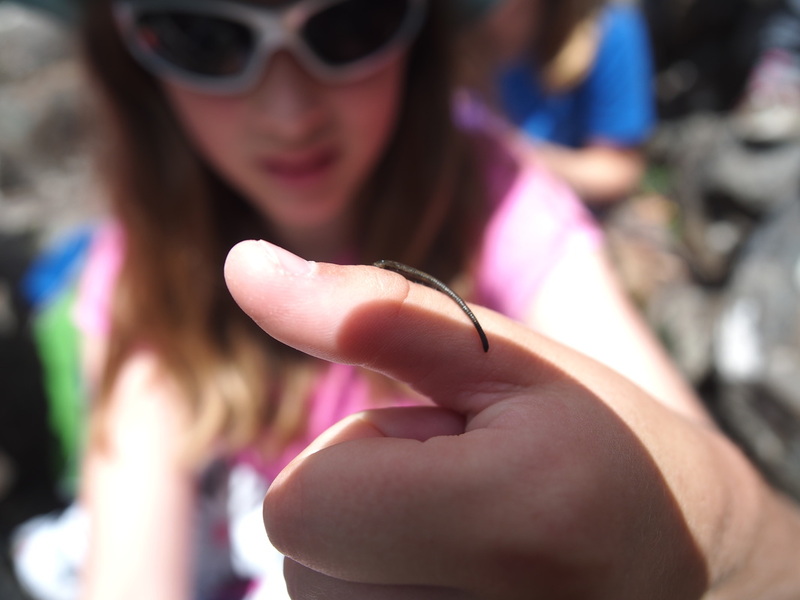 Being only ten and not having seen a leech before, the poor kid was pretty freaked out so I picked the little guy off and flicked him to the side. Holly was more curious and decided she wanted to see a bit more of it so she went looking for it and eventually made a new friend. After a while we started off again. The trees returned either side of the path, but they were shorter and less thickly clustered. When the winding path eventually climbed too high for them, the change in temperature was noticeable. 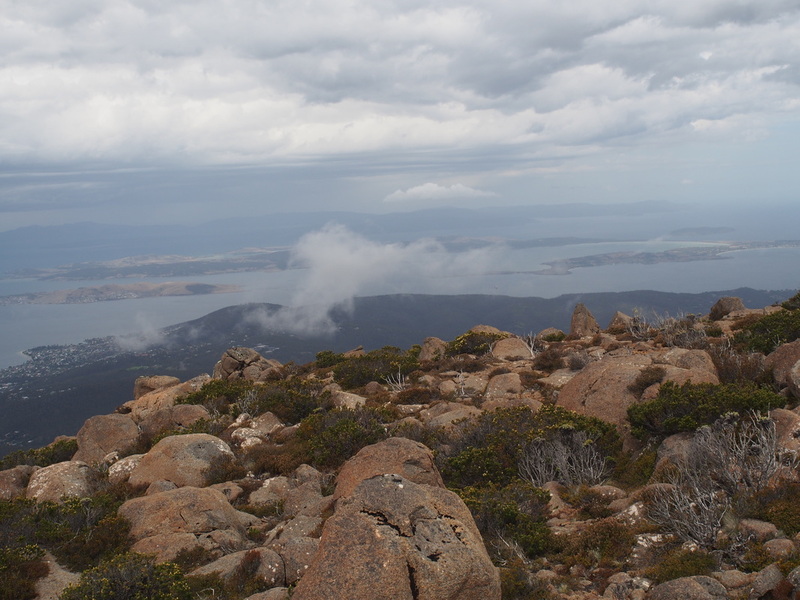 The view of Hobart was spreading below us and we could see more and more as we climbed higher. Looking up at the imposing blocky peaks we were heading for was a bit intimidating for a few of the students and some were also struggling a little with the steep gradient and the extended duration of the walk. I reached the top of the climb with Gloria showing tremendous courage next to me. I had acquired an extra three backpacks on the way up, so once we were all on the flat, we grouped ourselves in whatever shade we could find and sat down for lunch. You could not imagine how quickly these kids devoured several kilograms of carrot sticks after finishing their sandwiches either. The scenery was pretty impressive with distant peaks in every direction and large expanses of the Derwent River behind us. The top of this part of the mountain looked like it had been put together by someone who had never played Tetris (or who had rage-quit after the first attempt due to poor spatial skills). It seemed to be composed of hundreds of irregular stone blocks of differing sizes, which had just been dumped in piles without any plan. 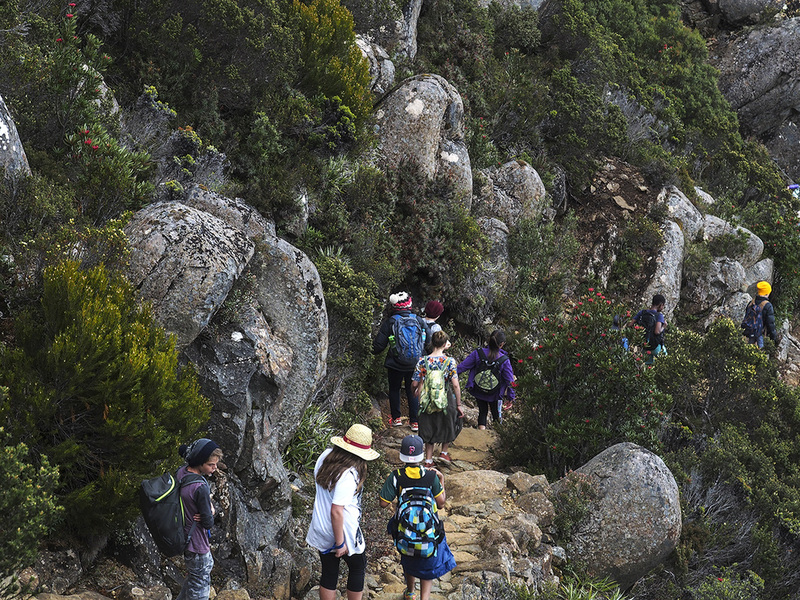 With some kids definitely having already pushed themselves to their limits to get to the top, it was time to split the group before going any further. Those who wanted even more challenge continued on, walking along the top of the mountain to its northern summit, accompanied by myself and my Dad. Those who felt they had come far enough turned around and made a descent with the other staff. It was a pretty even split between the groups, which suited us pretty well. The track curved around with little gradient for a while, but then we began to climb again, heading for a second raised plateau. The track itself narrowed until it was just a winding watercourse and then simply a series of cairns strung out along the rocky terrain. Once up on the higher plateau we scuttled and hopped our way from rock to rock. For the adults of the group, this method of travelling was a little tough on the joints, although offset by incredible panoramic scenery. By contrast, the children saw this section as their own freestyle parcour arena and flew across it with ease. 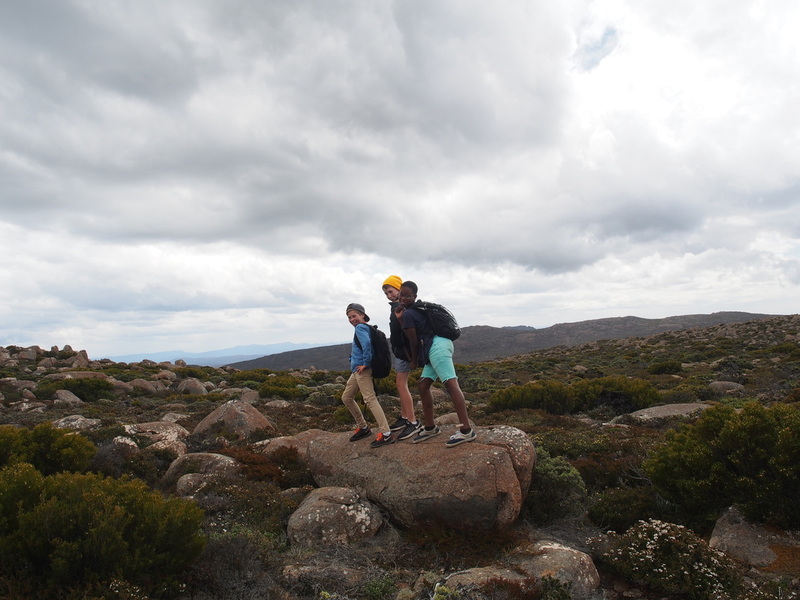 Sean and Matthew in particular, showed Jacqui Lambie levels of individuality, refusing to follow the same path as everyone else, bounding up the side of rocks and leaping the gaps in between as he zigzagged across our path. This part of the journey was a highlight for many of the kids, but it was amidst all this excitement that the second little crisis of the day occurred. Scarlet slipped on a wet rock and fell in a puddle, twisting her ankle. It was a bit sore to walk on so she ended up going on my back. It was at this time that I was very glad that Mighty Masyn was along for the walk. Despite being only 12, Masyn is as tall as many adults and since I had Scarlet on my back, he had to carry my heavy backpack, complete with first aid kit, spare clothes, water and food. It was a pretty heavy load, but the man-child carried the burden as easily as Geelong carried Mark Blake in their 2009 premiership. We continued along our obstacle-filled course, as the blue sky quickly clouded over from below us. As it got greyer we closed the group in closer together. My talkative backpack and I were at the back, while my Dad led at the front. We stopped for another break after another half hour or so, finding many comfortable stones to sit on amidst scenery that could have almost been rendered on Minecraft for its blockishness. 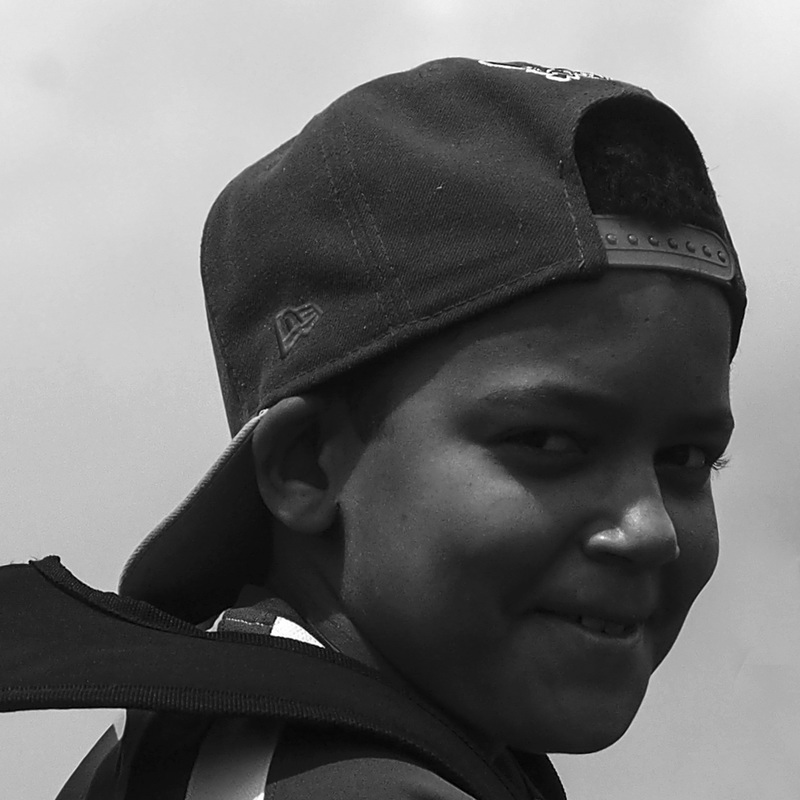 Ibby, James and Ned thought this would be ideal for modelling the cover photo for their boy band’s debut album. They are still working on the band name but Wrong Direction, Backhouse Boys or Nedelicious have all been thrown up as possibilities. After our break, we clambered over a small rise and we could see the radio antenna and the end of pinnacle road. We decided not to actually walk up all the way to the northern high point as that part of the walk is a little uneventful, instead taking a rough track that cut down to the start of the zigzag track. From here, we could return to the Springs and meet the rest of the group. Looking downhill from the edge of the zigzag track makes you feel at times as if you are in as perilous position as Clive Palmer’s nickel refinery. 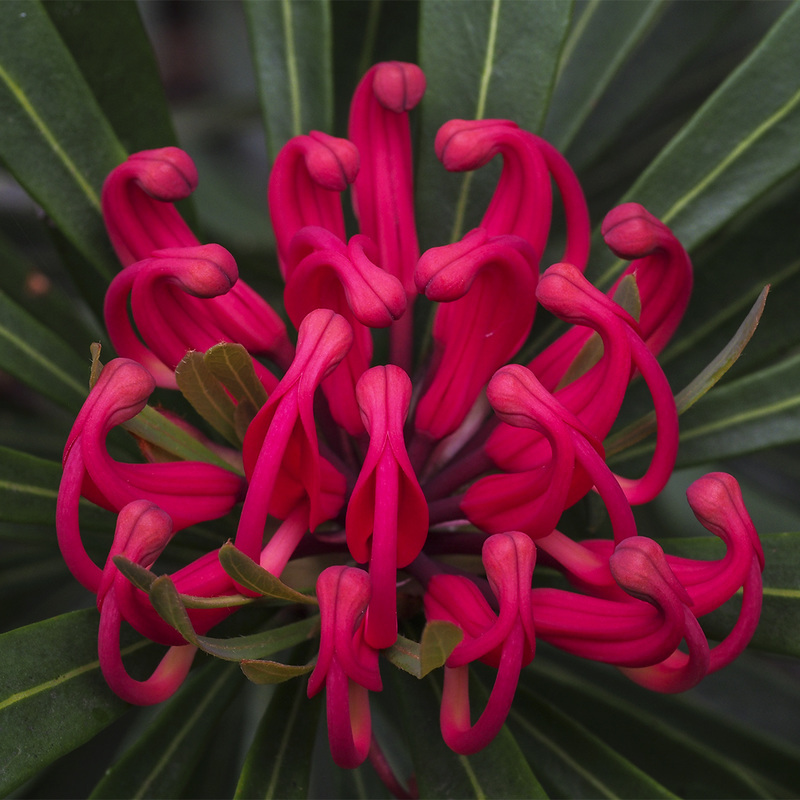 The ground appears to drop steeply away right below you, leaving an incredible view of green and orange foliage below stretching away until the first signs of Hobart proper begin to emerge. The clouds from earlier had blown away again so we could again see all the way to the Eastern Shore. 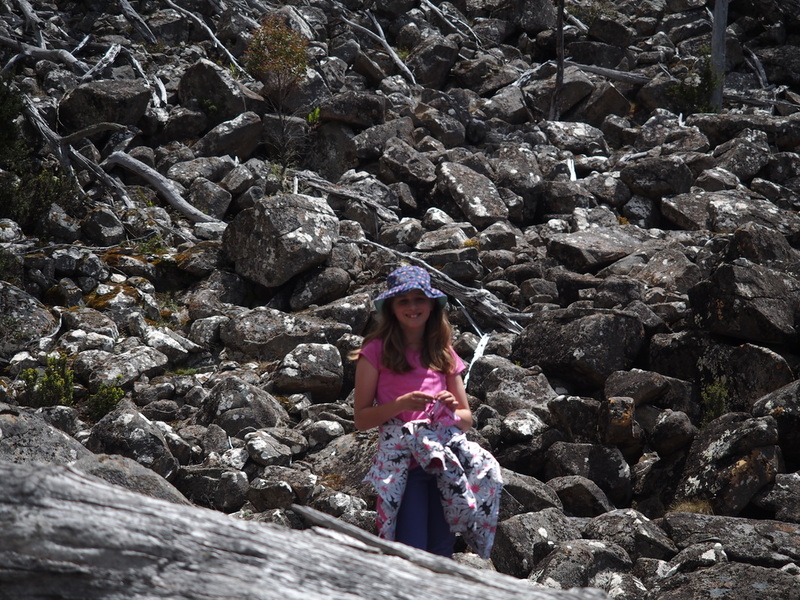 Scarlett had decided she was right to walk for a while again by now, so we were making our way carefully down the steep rocky path that had somehow been carved into this part of the mountain. It was very uneven, and changed course more abruptly than Oscar Pistorius’ fortunes, with loose stones and sudden drops frequent as well. For this reason I decided to take the lead this time. After about 20 minutes I heard a cry from further up the track. Hearing my name called, I walked back about 20 metres and found this time Indy had taken a fall and once again was feeling a bit too sore to walk. When Masyn heard his name called again, he must have sighed inwardly, but he came up and again took my pack without a word of complaint. For my part, I was thanking fate that it was the smaller students who had fallen over up until now. That wasn’t to last however, with Hadi taking a bit of an ambitious leap, a little nonchalant of potential consequences (henceforth known as doing an Ian Macfarlane) and rolled his ankle pretty badly. Tough kid that he is, we strapped him up and he battled on. We continued more carefully down the trail and it began to get easier after it turned away from the mountain’s face. The track got flatter and wider, but this didn’t stop Astha and Meghan having a few falls as their tired legs slipped occasionally. Not that they complained. In fact, once Indy had decided she was ok to walk again the older girls took her with them for the rest of the descent. Halfway down, we stopped to stare at the giant boulder that was dislodged a few years ago and came to a stop close to the track. Being the size of a large vehicle, it was fascinating to the students- as was the path of destruction it had left behind which could still be seen clearly going right back up the mountain. 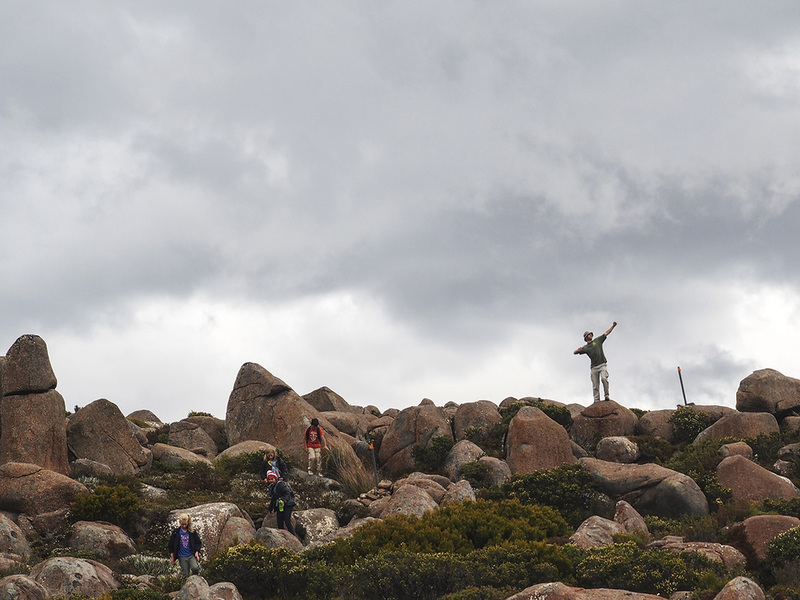 The track became even easier after the boulder, as we dropped into the treeline, although we lost some of the picturesque view of Hobart we had become accustomed to. After less than another hour, we were returning with some little weary legs to our meeting point at The Springs. Not that many people were there to meet us, as most of the other group had decided to go for another walk to nearby Sphinx Rock, leaving less people than the United Patriots Front get to a march. I considered taking this intrepid group further and following the others for all of a split-second, before I realised just how tired they were, having walked for almost an entire school day. This decision seemed an even better idea a few minutes later when a gentle drizzle began, before strengthening into some quite strong rain. We were pretty quickly into the stone cabin nearby and the wonderful Elaine made a fire. It was a pretty utilitarian space, but compared to being outside in the rain, it was as good as finding the Batcave for the kids. Piper had even brought a powder to throw on the fire which made it change colour, so we sat inside and watched the fire for a little while until the other group got back. As they had been caught in the rain (without a pina colada in sight either) they were much wetter so the first group made some room by the fire to let them dry. Anticipation of the bus back to camp was as frenzied as the excitement for the New Star Wars movie and soon enough the bus arrived to take us back to camp, where Mr A was already cooking a BBQ. I was incredibly proud of the students’ courage, tenacity and support for one another throughout the walk- but that didn’t mean they wouldn’t have more jobs to do for me after dinner.